I wrote this article on the wonderful coffee house more than ten years ago, however the historical details are still interesting, I think. Renovation work is now beginning on the one-time Centrál Coffee House. Work started on the reconstruction on June 29 and will continue for a year and a half, with completion date pegged in at July 15 1999. Dr. Somody Imre, director Pharmavit Rt. bought the building and is financing the 1,100 million forint project through a private company, which he established specifically for the coffee house renovation. When it opens its door again in October 1999, the building, which stands at the southern left hand corner of Ferenciek tere will have office buildings on the upper floors, while the ground floor will recreate the former glory of the famous coffee house. Together with the renovation work on the Ybl Palota opposite, this will make Ferenciek tere, the square of the Fransiscans, an elegant place of learning once again. The university library stands on one corner, the Ybl Palota and the Károlyi Mihály literary museum further down the road, when the Centrál Kávéház is ready, the only corner with not quite such a high-brow reputation will be the northeast nook, where the Bonnie and Clyde bar offers roulette and darts. The Central opened in 1887, in the freshly-constructed house belonging to Lajos Ullmann Erényi. It was the heir to the Philosophus Kávéház which had stood a few blocks away a few decades earlier. “The lamps and the whole interior decoration, like the marble tables, sofas, billiard tables, the whole games room and the coffee kitchen, moreover even the cups and the pots are so beautiful that it is impossible to imagine anything more beautiful,” wrote a critic at the time. The Centrál soon became the centre of intellectual life, although it was almost exclusively male scholars and writers who made the Centrál their local. It was the place where József Kiss edited the Hét (‘Week’) weekly literary paper, for which many big names worked before the Nyugat (‘West’) paper was formed. All the 400 coffee houses of the capital had subscriptions to Hét. Kiss also taught young writers the secrets of language, verse and writing. Famous writers worked here in the Centrál around the so-called “big writers’ table” - among them Kálmán Mikszáth, Sándor Bródy, Gyula Krúdy, Andor Kozma, Zsigmond Justh and Zoltán Ambrus. Even Endre Ady, who had different home-from-home cafe, the Három Holló (Three Ravens) (now the Goethe Institute) was known to frequent the Centrál. In 1907, younger writers in the Hét group formed Nyugat and soon moved their headquarters to the New York coffee house, on the corner of Erzsébet körút and Dohány utca, near what is now called Blaha Lujza tér. Then, in the twenties the Nyugat paper moved back from the New York coffee house headquarters to its birthplace in the Centrál coffee house. 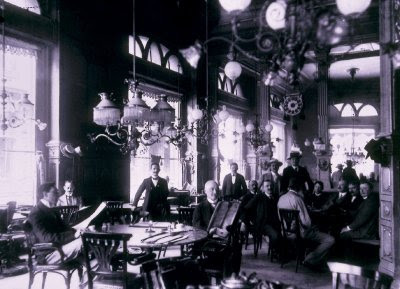 From 1905, the Centrál was run by former bank offers Gyôzô Mészáros, who was also the head of the Budapest coffee house association and he, as a professional protected the high standard of the artistic institution for many decades. The atmosphere was conducive to writing, as wafts of coffee brewing aromas occasionally reached the writers, who sat hunched over scraps of white paper, waiting for inspiration. Cigar smoke spiralled up towards the chandeliers, mixing with the low mutterings of authors thinking out loud. No business deals or loud noises disturbed the creative atmosphere. Mészáros put the men of letters on a special gallery so that the ordinary citizens would also be able to witness the shining examples of intellectual life, literature, science and fine arts. Loud words, disruption of order, or snobbishness were not tolerated in the Centrál, which was open day and night. The coffee house was philanthropic in its actions as well as its principles. Those in need were helped with credit, small loans besides the moderately priced coffee, peaceful surroundings, and the Hungarian and international press. The First War World disrupted the clientele of the Centrál as many young writers were conscripted. Zuboly (Elemér Bántai) became the first casualty amongst the writing regulars in 1915, two years later the poet Géza Gyóni also lost his life. “The only remaining piece of Pest was the Centrál,” wrote Mihály Babits. It was somewhat shaken by the fighting, some of the tables’ marble tops were split, the mirrors had grown hazy, the porcelain buttons on the armchair coverings also showed the marks of time. On the wall was a memorial tablet to Zuboly, with a bronze relief, under which was engraved some lines of verse by his friend Ady. During the twenties, the Nyugat once again had its special table in the Centrál. Babits’s Sons of Death novel gave a role to this much-loved place where, “through the nonsensical cafe house smoke, the aroma of delights of days gone by fluttered”. Coughing slightly, the ‘sad poet’ Árpád Tóth, scuttled in, his lungs ruined by the damp air of his rented room, the printing room and the smoke from his own and surrounding cigars. Zsigmond Móricz would make his slow dignified procedure over to the Nyugat table, sit down, drink a coffee, light a cigar and hide himself away in his thoughts and a thick aromatic cloud. The Nyugat editor took his place without a sound, while Frigyes Karinthy and Dezsô Kosztolányi blustered in more noisily. Aurél Kárpáti, Ernô Szép and Ferenc Molnár and the whole editorial team would spend hours discussing topics. And so life continued in this bastion of literary life, “In the Centrál, where along with many famous or now forgotten men I also rocked my cradle”. wrote János Kodolányi. Other scholars frequented the Centrál with their books, librarians, museum curators, and university professors. Artists also sipped coffee in the Centrál, although they did not have a particular separate circle of their own here. József Rippl-Rónai signed one of his paintings with the words, “I drew this in the Centrál Coffee House”. Many men of letters worked here day in day out, and went to the Centrál as if it were their office. After the Second World War, the Újhold (‘New Moon”) editorial was formed and operated in the Centrál. Ágnes Nagy Nemes, Pilinszky, Balazs Lengyel, Mándy, Sándor Rákos and others worked here on Tuesday afternoons until late at night, preparing the paper and editing. In 1950 the Paprika Centre National Company took over the premises. This company, which built the little yellow underground, made the premises its culture centre and canteen. Then, from 1967, it became the Eötvös club - the popular ELTE students' club, where groups like Omega entertained the college crowd and Zorán and the Metro band began their careers. The old stippling on the walls remained virtually intact. However, the chandeliers made in Vienna were smashed and pawned at the MÉH - recycling depot. Then the premises became home for the Wizards amusement arcade with an unspectacular and less literary tenancy until recently when Dr. Imre Somody bought the building. Now, it is hoped, a thriving literary life will return to the heart of Pest. “That special place has now disappeared, the place that was neither club, nor pub, neither an association nor a restaurant, neither a casino nor a presszó, but something more democratic than all of these - a coffee house,” wrote Dóra Pataky, the interior designer for the new Centrál. The Centrál will again be a place where, “fascinating discussions will whirl on all topics by a company of people who will talk and argue late into the night on politics, art and ideologies while women decorate the scene with their beauty”.